On Sunday, Garry Trudeau published a strip that I’ve seen coming since Donald Trump won the election. But even though I knew this gag was on its way, actually seeing it in print cracked me up. First it’s a great joke. 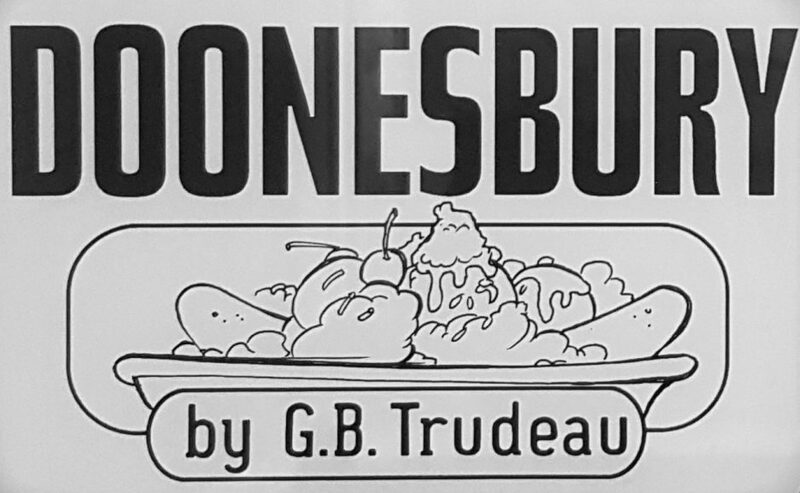 Second, because, by recycling a strip from 44 years ago, Trudeau demonstrated his ability to do what so few people have been able to do – create a body of satire that is as in tune with its time as it was when it debuted almost fifty years ago. The strip begins with Mark reminding himself – with the #resist hashtag – why he keeps providing commentary about Donald Trump (“that jackass”) on his radio show. After his assistant runs down the day’s material for him, he points out, as several commentators already have, that even if the Robert Mueller investigation exonerates him, “Trump sure acts guilty.” With that word comes the moment I’ve been waiting for since November 2016: a flashback to the 29 May 1973 Doonesbury strip, in which Mark excitedly pronounced Richard Nixon’s Attorney General John Mitchell “GUILTY! GUILTY, GUILTY, GUILTY!! !” of unnamed crimes.1 As is so often the case in a good Doonesbury strip, there are two “punchlines”: the climactic moment in the penultimate panel and a denouement that offers a deeper level of commentary or analysis. In this case, it’s a comment on how people of Mark’s and GBT’s generation have been resisting the abuse of presidential power for long time now, complete with a reference to their generation’s fondness for psychedelic drugs and the resulting after-effects. In response to the 1973 strip, a dozen newspapers dropped Doonesbury. The Washington Post – now, ironically, Doonesbury’s online home – argued that guilt or innocence should be adjudicated by “the due process of justice [and] not a comic strip artist,” and maintained that it could not “have one standard for the news pages and another for the comics.”2 Kerry Soper, in Garry Trudeau: Doonesbury and the Aesthetics of Satire, frames the Post’s “discomfort” with the “GUILTY!” strip as a product of the “problematic” fact that Trudeau blurs the line between “comic strip storyteller, journalistic muckraker, and political watchdog.” This grabbed my attention because it shows us how we might understand Trudeau as a precursor to the generation of late-night comics who came into mass popularity during the George W. Bush era – Jon Stewart, Stephen Colbert, and now Samantha Bee, Trevor Noah and John Oliver – who have become critical voices for a younger generation turning to satire to expose and ridicule political malfeasance and incompetence. Soper also points out that the “GUILTY!” strip contains multiple layers of meaning: Trudeau is both celebrating the possibility that a politician accused of serious crimes may pay for his misdeeds and “poking fun at … Slackmeyer’s stridently leftist political leanings.”3 The 22 October strip can be read in much the same way, though I suspect that, given the nature of the current political climate, the former reading outweighs the latter. After all, Mark is no longer the ranting and raving campus radio host he was in 1973 – he’s older and a little more jaded, to the point of having to remind himself of why he has to keep speaking truth to power after so many years. Moreover, 1973 and 2017 represent, I would argue, fundamentally different media universes, and the two strips speak to important changes in what media are and how they work. Reading the Post’s rationale for yanking the 1973 strip – that cartoonists should be held to the same standards as the journalists with whom they share newspaper pages – raises a question for scholars of communications and media: Why is pretty much the exact same joke, 44 years later, no longer a violation of journalistic ethics? One may quibble and point out that this time, Trudeau only said that Trump only “acts guilty,” a fairly objective reading of the current situation, and not that he is guilty. It’s also clear that, in the age of Trump, many media outlets are less interested in maintaining an air of respect for, and objectivity about, politicians who cross particular lines; that well may be a lesson of Watergate and part of Nixon’s legacy. Beyond that, the fact that this strip was published apparently without widespread ethical concern speaks to how corporations and new media have successfully blurred the line between journalism and entertainment. If Soper is right that GBT’s work grew out of his overlapping roles of reporter and satirist, and if I’m right to see him as an early example of the current trend of blending reporting and satire a la Stewart, Bee, et al., then this week’s strip may be seen as an example of how reactions to the crimes of two Republican presidents were instrumental in shaping that tendency. Sunday is not the first time that Trudeau has referenced the classic “GUILTY!” strip. On 5 May 1994, soon after Richard Nixon died, the “GUILTY!” strip kicked off a week in which GBT re-visited some of his best work of the Watergate era, but with each strip “updated to promote reconciliation” (or some variant thereof) in light of the way the nation seemed to have forgotten how the man had violated fundamental principles of democracy not two decades earlier. In contrast to this week’s revisit of the “GUILTY!” strip, rendered in the original, roughly-hewn Doonesbury style, Trudeau chose to redraw the original arc to fit his style at the time, using the cleaner lines, more interesting composition strategies, and greatly increased dynamism that separated his 1990s output from his pre-1982 hiatus work. The 1994 “rehabilitation of Nixon” arc allowed GBT to critique how America can be reluctant to engage with its past – it’s way easier, after all, to re-frame a demonstrated enemy of democracy and a man who engaged in massive violations of the laws of international conflict as a statesman who ruled in difficult time than to admit that the system produced such a horrible leader. We see the same dynamic in play now in the current tendency for anti-Trump activists to forget that George W. Bush is a war criminal when he says bad things about the current president. CODA: Thanks to sharp-eyed reader Tad, who pointed out another appearance of the “GUILTY” gag. In 1987, with the Iran-Contra scandal underlining the extent of the corruption of the Reagan administration, Mark dusted off the line after comparing Reagan-era officials like John Poindexter and Oliver North to Watergate figures like H.R. Haldeman and G. Gordon Liddy. 1 In 1975 Mitchell was indeed found guilty of conspiracy, obstructing justice and perjury. He served nineteen months in a minimum-security prison. Next ›Comic Review: Tailsteak’s Forward. Hey — you’re right. I’d forgotten about that one. I’ll have to update the post. Thanks for getting in touch, and thanks for reading my little blog.